Sunset Cottages Unit 5C-Navy and Red Nautical them decor through out unit in bold colors, very unique. Two bedrooms with one upstairs with a queen bed with pillow top mattress, private bath, Flat screen 32" TV, sitting area, desk and balcony. Second bedroom hosts a queen size bed with pillow top mattress, 32" TV/DVD player and balcony. Bunk area with two twin. Shared second full bath for bunks and second bedroom. Living room hosts a queen size sleeper sofa, Flat screen 50" HD LED, WIFI capable tv, Stereo. Plenty of nice linens provided. Fully stocked kitchen and dining area for 4. Balcony with french doors off of living dining area with view of the gulf. Washer and dryer in unit. Graco Pack n Play and high chair available in unit. Wireless internet. Beach Service included in rental March through October, (2 chairs and 1 umbrella set up each day at the beach for you. I go the extra mile to make sure you are comfortable. Extra paper towels, toilet paper, cleaning products, laundry detergent are provided. I even provide a few board games, books, and movies. I also provide beach towels and beach toys. The only thing you need to bring is food and clothes. This is a small, quaint and private complex with a total of only 19 units. The pool is solar heated and centered in the middle of the complex so every unit has a view. Barbeque area next to the pool. 100 yards to the beach on private boardwalk. No streets to cross. Activities (on-site and nearby): Parasailing, Jet skiing, Fishing, Boating, Theaters/Cinemas, Shopping and Dining Out. Convention Center, Gulfarium and Okaloosa Island Convention Center just a few minutes away. Just down the street from the famous restaurant FUDPUCKERS!! Deep sea fishing and Outlet malls just a short drive to Destin. I live in FWB so I am close if you need me. Small complex. Uncrowded beaches. Only ten minutes to Destin. The condo was convient to all the local attractions and a short walk to the beach!! Didn’t like the 3 flight of stairs, but that didn’t stop us!! The noise from the construction next door was a little distracting, but overall a good experience. We are very happy to hear that you enjoyed your stay. This condo is located in a very peaceful, relaxing area and is just minutes from amazing restaurants and entertainment. We do apologize for any inconvenience the construction was but are pleased that you had a good time and please remember that returning guests do receive a 10% discount. Very nice condo. The dryer was too tall for me to see how to work but everything else was great. We are glad that you have enjoyed your stay in Sunset Cottages 5C. This very beautifully decodated property has great sleeping arrangements and offers privacy for all. The property is in a very convenient location and will rpovide you a quick access to the beach and the pool. The unit is stocked well for your convenience. We loved everything about our trip. The only drawback would be the construction of a new hotel right next to us. It took away the view and it was really noisy. We are glad that you have enjoyed your stay in Sunset Cottages 5C. This unit is lovely and welcoming. 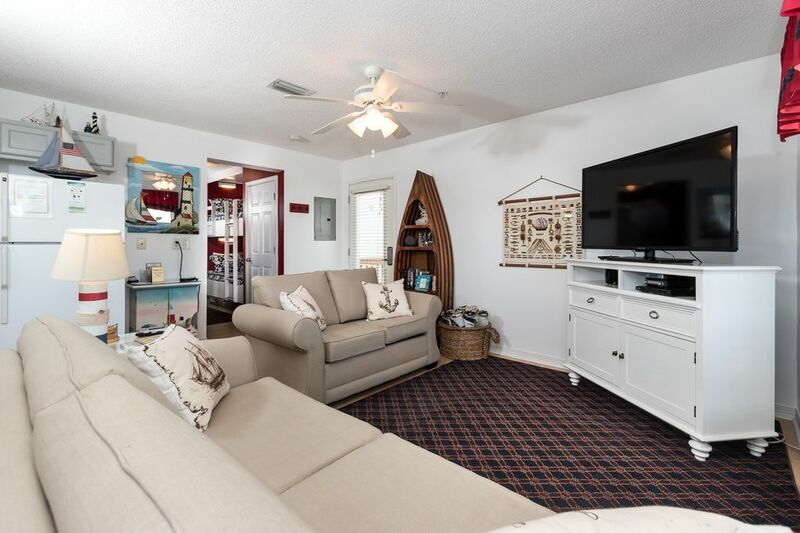 Great choice for your vacation on the Emerald Coast. We maintain and stock the property well in hopes that you can have more time to enjoy with your friends and familly. We regret to hear about the inconvenient construction near the property and hope that construction will be completed soon, however we have no control over that process. We hope to see you soon and would like to remind you to use our 10% returning guest discount for your future stays with us. Very enjoyable vacation. The complex was nice and quiet (other than construction going on next door). Just a short walk to the beach. The condo was very clean and equipped with everything you need. There is even a high chair and pack-n-play, which was great and you can save packing space when bringing a little one. We will definitely plan another vacation here! We are glad to heat that you had a great stay in Sunset Cottages 5C. We strive to provide as much comfort as we can for the duration of your stay regardless of what your needs might be. This unit is beautiful and stocked wevy well with items for your convenience to use. We will be happy to see you soon and make sure you use our 10% returning guest discount. Nice cottage overall but the mattresses were very uncomfortable. Also beware (July 2018) that next door they are building a new condo complex and the workers arrive at 5:40am M-Sa to wake you up. Excellent location. 10 minutes from Destin but quiet area to stay in. Beach was beautiful! Check in and out was so easy! The coffee pot was broken when we tried to use it the first morning but I called the number provided and they had a replacement out there before we got back from the beach! Condo was clean and had everything we needed. Beds were comfortable and plenty of room! The beach was clean, we had 2 chairs and an umbrella each day with the condo. There were some boogie boards, a chair, and beach toys to use too. Would definitely stay there again! Thank you for the amazing review and we hope to see you next year!